To deal with the increasing threat of the Klingons and the tactical advantage they have with their carrier ships, the Federation has called upon their member worlds for assistance. In response, the Caitians made their fierce Atrox Carrier available to Starfleet. 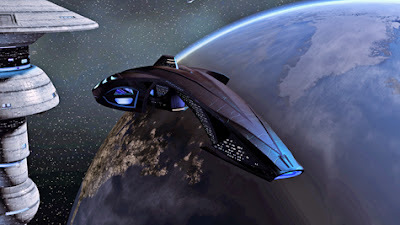 A true carrier, the Atrox has been updated by the Caitians and the Starfleet Corps of Engineers with modifications that give it some of the abilities of a science vessel, including subsystem targeting and bonuses to Shield and Auxiliary power. 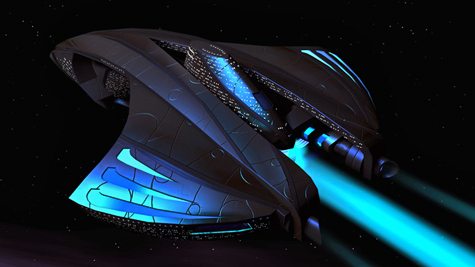 These abilities allow the Atrox to support its fighters as well as other ships in its fleet. The Atrox comes standard with two hangar bays, each stocked with Caitian Stalker Fighters. These stealth fighters can mask their energy signature and are equipped with Tetryon Pulse Cannons and a Thoron Device. Caitian Stalker Fighters can be launched from any Flight Deck Cruiser or Carrier.